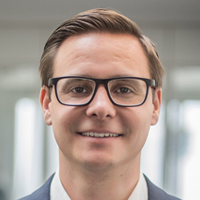 Muller Martini - What role do automation and networking play in Finishing 4.0? Home / Newsroom / Blog / What role do automation and networking play in Finishing 4.0? What role do automation and networking play in Finishing 4.0? In the first article of our Finishing 4.0 series, I provided you with a basic overview of the Finishing 4.0 development strategy. Today, I would like to provide you with a more detailed look at the role played by automation and networking. Finishing 4.0 refers to a number of intelligent solutions developed for finishing digitally or conventionally printed products. Similar to the concept behind Industry 4.0 ,Finishing 4.0 involves the production of print products that are customized – i.e. they contain personalized content – and variable – i.e. they have different formats and thicknesses. In extreme cases where each product looks different from the next one, the print finishing machines need to have the latest drive technology. This allows them to be adjusted individually for each end product. We still, of course, want to take advantage of the benefits of industrial production. This means as little manual work and as much automation as possible. Despite the individual end products, the production process must be reliable. The machines must provide both high performance and quality. We need short changeover times for short and ultra-short runs. The operator needs to be supported by operating wizards integrated in the machine. There are exciting new developments under way in all areas of print finishing. For example, for the production of softcover books, each of the Vareo perfect binder’s three clamps has its own servo motor and operates individually. This means that every processing step can be adjusted individually in line with the product. And this is useful both for products that are printed using the offset process and those that are produced digitally. If you produce hardcover books, the Diamant MC Digital bookline can automatically change over segment by segment. The time needed for format changes for each product can also be kept as short as possible. Perfect for short-run productions and runs of one, which are often seen with the globally popular photo book format or on demand products – where the right book case has to be inserted automatically. With the SigmaLine, we’ve gone one step further and made it possible – but not necessary – to integrate the digital printing press directly into the line. 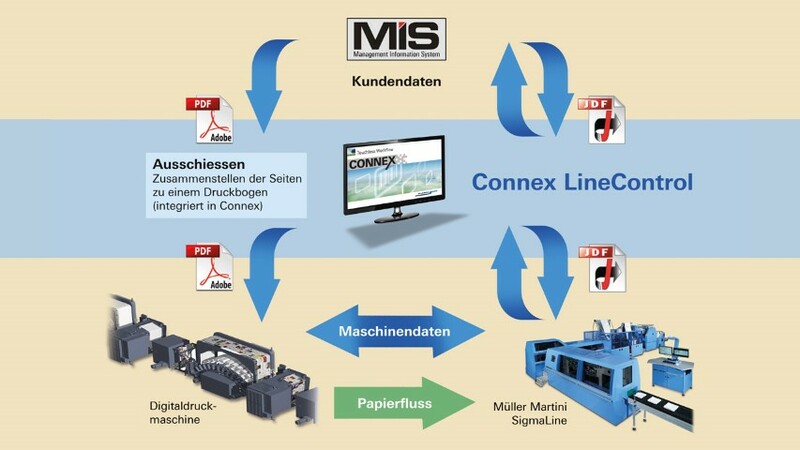 Both the printing press and the SigmaLine receive the orders to be produced via Connex LineControl Pro. As a result, there is a central control point for orders, printing and print finishing. Networking the systems is essential to ensure seamless operations. More information about how the SigmaLine processes digitally printed paper into book blocks can be found here. Automated systems are now state of the art at Muller Martini. But networking the individual, highly automated machines and all of the systems involved optimizes production and provides you with a decisive competitive advantage. In doing so, it is important to ensure a consistent focus on JDF/JMF, the CIP4 standard – from individual machine to the entire production line. This makes it possible to integrate all systems seamlessly via standard interfaces, for example, in your existing company networks. Erik Isaksen, Managing Director of Livonia Print, explains the benefits he has seen as a result of networking his machines. Which workflow makes sense for you? The workflow that makes sense for your company depends on your machines, your end products and the requirements of your customers. So there is no out-of-the-box solution. You need a workflow tailored perfectly to your operations. With the experience we have gained on a number of challenging projects, we can offer you very good support when it comes to these questions. You can network your production machines with the Connex workflow system. This system is the backbone of digital and conventional print finishing at Muller Martini and an integral component of many machine configurations. The system controls and monitors all processes required for production, thereby ensuring a seamless, fully networked workflow from the PDF to the finished book. It is also possible to analyze all data using Connex.Info. This shows, for example, how efficiently and quickly the equipment produces as well as its performance level. There is also a net counter and information about production waste. The performance screen displays the order, divided into the categories: changeover, production, malfunction and stopped. Finally, a report can be generated and, for example, sent daily by the system via e-mail or Skype. Reliable data is important not only during the production of ultra-short runs as small as one copy – it is also essential if you want to maintain control of your operations and ensure that they are efficient. With automation and networking, you can continue to earn money despite generally smaller print runs and increasingly diverse products. In the next article in the Finishing 4.0 series, I will tell you what to watch out for when each product is different from the others – think VDP! Are you interested in what the Finishing 4.0 development strategy is all about? Read part 1 of your Finishing 4.0 series.